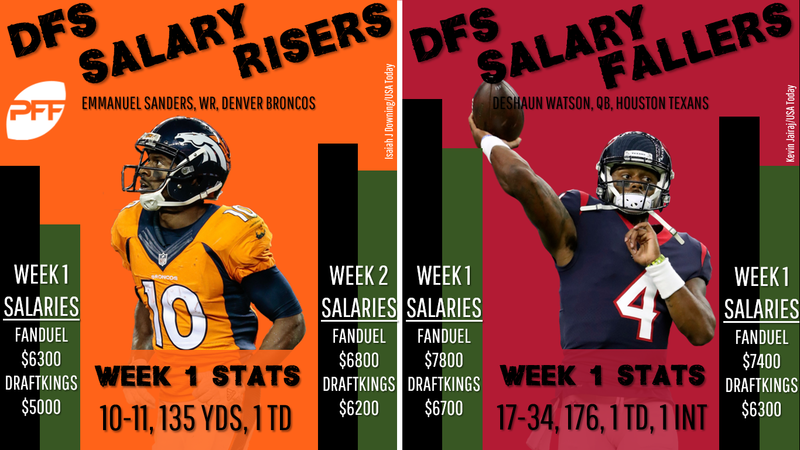 Most of the talk in DFS revolves around player matchups and opportunity — which are, of course, extremely important for fantasy football — but at the end of the day, you have to weigh those variables against the player’s cost. Player salaries move up and down as the year progresses based on matchup and opportunity, and one of the best things you can do is understand where a player should be priced versus where they are actually priced. Each week this season, we’ll start off our DFS prep by highlighting some of the players whose value increased or decreased the most across DraftKings and FanDuel. Conner’s Week 1 price was set while everyone still expected Le’Veon Bell to suit up at the start of the season, and he emerged as the most obvious play on the slate as a result. Conner ended up with 36 touches (100 percent of Pittsburgh’s backfield touches) for 192 total yards and two scores. He went from being priced as a backup to being priced in the top 10. He’s likely still a value in Week 2 with his expected volume against the Chiefs, who just gave up 166 total yards to Melvin Gordon. Sanders was a glaring value in Week 1 as DraftKings and FanDuel set his price as if the Seahawks pass defense was still great (it’s not). Sanders delivered with a line of 11-10-135-1, and his price shot up as a result. It still might not be quite high enough. The combination of Sanders (11) and Demaryius Thomas (10) accounted for 58.3 percent of all Denver targets in Week 1. It appears this offensive passing attack will be funneled through Sanders and Thomas once again in 2018. It’s amazing that Kamara, who was already one of the most expensive options in Week 1, saw his value increase so dramatically for Week 2. Kamara had just eight rushing attempts, but he saw the valuable goal-line work, which resulted in two rushing scores. He also posted a line of 12-9-112-1 through the air as the Saints played catch-up. Kamara draws the Browns in Week 2, who the aforementioned Conner lit up in Week 1. Cole was a popular Week 1 option because he was $3,800 on DraftKings and minimum price ($4,500) on FanDuel, and it looked like he was going to smash value when he caught a long pass on Jacksonville’s first drive. Cole ended up catching three of three targets for 54 yards — an acceptable game, but far from a great value. Cole has a difficult Week 2 matchup against the Patriots, who held Deshaun Watson and the Texans to just 176 passing yards last week. Everyone was focused on Royce Freeman versus Devontae Booker, but then Lindsay came out of nowhere and stole the show in Week 1. Freeman (29) led the backfield in snaps, but Lindsay (26) wasn’t far behind with Booker (19) a clear third. Lindsay and Freeman each had 15 carries for 71 yards, but Lindsay added two receptions on three targets for 31 yards and a score. Despite the success through the air, it should be noted that Lindsay (9) played fewer pass snaps than Freeman (11) and Booker (15). This looks like a full-blown committee in Denver, but Lindsay’s price will only creep up if he continues to see 12-plus touches per game. The Broncos are at home against the Raiders in Week 2. Funchess caught three of four targets for 41 scoreless yards in Week 2, and, to be honest, I’m not sure why his priced decreased so significantly on both sites. The Panthers lost Greg Olsen for an unknown period of time, and Funchess was tied for second on the team in targets in what was an all-around ugly Week 1 game against the Cowboys. The Week 2 matchup against the Falcons — who just lost safety Keanu Neal — doesn’t exactly warrant a big price drop on its own, either. We mentioned Booker’s teammate, Lindsay, above as a player whose priced increased. Lindsay’s price increase came at the expense of Booker. Booker had just two rushing attempts and two targets in Week 1. Denver’s trio of running backs had 36 combined touches, and Booker accounted for just 11 percent of that action (four touches). It’s a three-headed committee for now, but Booker could be the odd one out soon. Watson’s price-drop on FanDuel was actually the largest of any player on the main slate. He struggled against the Patriots, completing 17-of-34 passes for 176 yards, a touchdown, and an interception. He did have 40 rushing yards, though, proving once again that a rushing quarterback always provides a decent floor with his legs. Watson faces the Titans in Week 2, who gave up some long plays to the Dolphins in Week 1. The Texans will be able to pull off a few long plays of their own next week. For tournaments, the time to take a shot on a high-ceiling player like this is when their price drops and everyone is sour on them. Johnson carried the ball five times for 17 yards and added just one reception for eight yards in Week 1, although he was targeted five times. Wet weather didn’t help Johnson’s case last week, and his price took a big dip because of the sad stat line. However, he’s in a great rebound spot against the Saints in the Superdome, where the Saints just gave up 48 points to the Buccaneers. Johnson’s role in this offense is secure, and his 20 percent catch rate could end up being his season low (he had an 82 percent catch rate last year). Johnson becomes a value at his new price. Michel didn’t play in Week 1, but his fantasy stock still increased because Jeremy Hill suffered a season-ending ACL injury. There’s a role waiting for Michel as soon as he’s healthy enough to play — which could be in Week 2. The Patriots play the Jaguars, which would be as hard of a debut matchup as they come, but that could serve to drive Michel’s price down even further, which would make him a great value once the matchup is favorable.